Edited 1 time(s). Last edit at 08/25/2012 11:01AM by funtoy1001. bob_binz from raspberry pi forum reported that fw_disp_dx27893 matches this frame and here's the original firmware. How to update the list of supported frames with this information? > supported frames with this information? Atm add the CRCs given by identify.py and (optional) an url to knowndpfs.py. Note: will change soon - knowndpfs.py will be replaced by a file to be autogenerated from infos in src/lcd/ <model>/dpfmodel.h files (working on it). These "dpfmodel.h"-files will also replace the "#if defined / #ellif defined .." spaghetti-code in src/config.h (already done, made adding contrast settings much cleaner). So in the future all model-dependent infos will be in one place. Can someone edit it with my ID information. That this works? Or should I really switch to linux. Added your flash (Winbond W25X32) to FlashLib.ini. > You can try the focal or focal_landscape fw. Now I am a little bit confused about this. 1.) Is the VNC Feature now fully useable with my DPF ? 2.) Is there any new firmware I need to flash on my DPF to get VNC working ? 3.) Does the VNC Feature need to be configured and compiled into lcd4linux? 4.) Is it possible with current firmwares that the Background Illumination can be dimmed or turned off by lcd4linux? Is there a up to date guide I can follow so I will get the thing up running with VNC! Thank you in advance for clearing up these questions! Is there also a way to change the view-mode of PyDPF while running? So e.g. when MPD is Playing it shows the MPD Informations and when MPD is not playing any Music the Display will show Time and weather or something else? For all of you who are struggling to get lcd4linux compiled with mpd support I am providing here a checkinstall DEB package of lcd4linux with mpd Support compiled on dockstar Debian wheezy. Maaaaan.. This was a real big fat PITA!!!!! Think this would be really helpfull for a lot of people! I am still struggling with the errors of PyDPF... Can someone help me? I think google had changed their API or whatever so the GET requests from the PyDPF.py script are blocked from google's site! How can I resolve this?! Edited 8 time(s). Last edit at 09/17/2012 08:33AM by BigRon. First of all thank you very much for your fantastic job on this project. I recently acquired an egg-shaped dpf (it looks like this http://www.jovisa.biz/images/egg%20dpf%20or%20copy.jpg ) that was succesfully flashed with the acme_1 firmware. The only problem is that, once again, the contrast makes the screen unreadable even at maximum brightness. It's way too dark. Just a question: every time I try to disassemble the original firmware (1MB dump), d52 complains about the file being too big. What should I do? > about the file being too big. What should I do? Head over to ax206geeks's wiki. Have a good look at the "Reverse Engineering the firmware" part. Restore.py needs spilib.bin which must be in the calling directory. Thanks that worked and I have hacked the DPF. Now I have another problem, does anyone have an lcd4linux ipkg with dpf driver support and mpd plugin or know where I can find a guide to build it myself? Looking for firmware.............: Found (coby, 240x320 px). Let me know if something else is required. Hope you can help me. > Thanks that worked and I have hacked the DPF. Check my post(s) on page 21 of this thread for script that will do that for you. I ran the script and made a working lcd4linux package but it refuses to install because of missing libdpf. I am running this on a mips (openwrt) sustem, do I need to crosscompile libdpf for mips? If this is outside this thread I appoligise this is just the only active place I know where people are talking about this. I think I just don't understand what libdpf is, I see many versions of it ie libdpf.o libdpf.h etc. Can I just copy this to /lib ? Sorry it this is a dumb question I am new to this. Can you post error message(s) that you are getting? Hope, you can help me with that. * opkg_install_cmd: Cannot install package lcd4linux-custom. I did not realize that you are crosscompiling, the script is meant to run on ARM device (dockstar or raspberry pi). Are you crosscompiling on PC linux machine? I suppose if you follow script line by line you will see what it is doing and you can modify it for your environment. The missing libdpf library and module is built during compilation of dpf-ax firmware. Only the menus not working? Does the menu highlight move correctly? Is the splashscreen displayed correctly after reset (cocktail)? Edited 2 time(s). Last edit at 09/30/2012 04:47AM by superelchi. > Only the menus not working? > Does the menu highlight move correctly? It looks like I can display something with lcd4linux and the whole display seems to be usable. Even after reset there is no splashscreen, I only get black screen. After pressing menu button I see the menu. After starting lcd4linux I can see the output on the screen. Strange. The init and blit code is very similar to the original Pearl. In fact fw_disp_delightdigi_black_portrait works on my Pearl. Splash, menu and everything. Could you try if one of the attached Pearl fws works on your dpf? > Pearl. Splash, menu and everything. > works on your dpf? Hello, really apprieciate your help. I've tested all of them. fw_disp_pearl.bin and fw_disp_pearl_custom.bin look very similar to what I've describe before: white screen, black highlight line. On fw_disp_pearl_custom.bin when moving around in the menu, I've got a crash with red background. fw_disp_pearl_portrait.bin works nice (almost perfect) I see the coctail splashscreen and the menu correctly I aslo can use the screen. 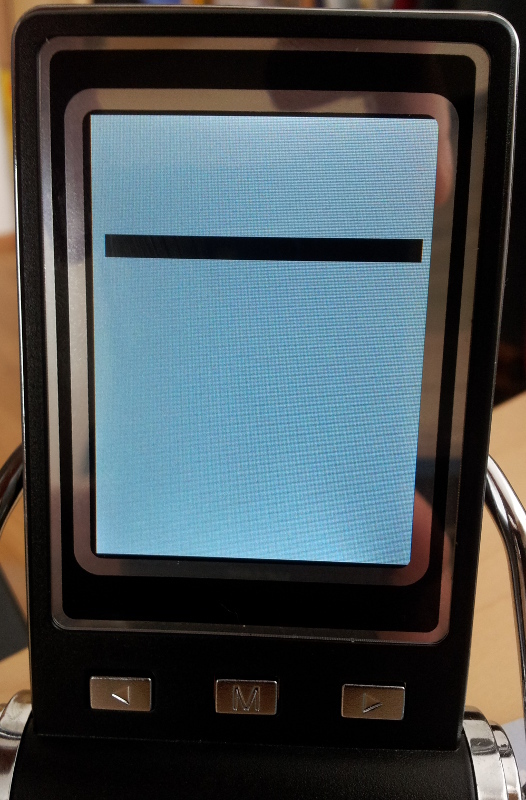 The only problem the screen (splashscreen, menu, and lcd4linux) is upside down (rotated by 180 degrees). Could you somehow rotate it? I've just ordered one of these beasts to have a closer look. I fear you have to live with the rotated display and/or missing menus until it arrives. Shipment may take a couple of weeks to Germany. Edited 2 time(s). Last edit at 10/01/2012 07:54AM by superelchi. strange things going on here. After you message that I have to stick either with working menus or working display. I've compiled trunk once again running the script from http://forum.doozan.com/read.php?9,2435,9321#msg-9321. Afterwards I flashed the fw_disp_delightdigi_black_portrait.bin firmware and it works nicely. I see the splashscreen (coctail), the menu, and display is working nicely. As it looked very strange to me, I've tried to reproduce it. I've restored original firmware, and then flashed again with fw_disp_delightdigi_black_portrait.bin. An it works.